Ladies and Gentlemen! Welcome to the Big Top! Step right up and prepare to be amazed! A grand light show awaits your senses! 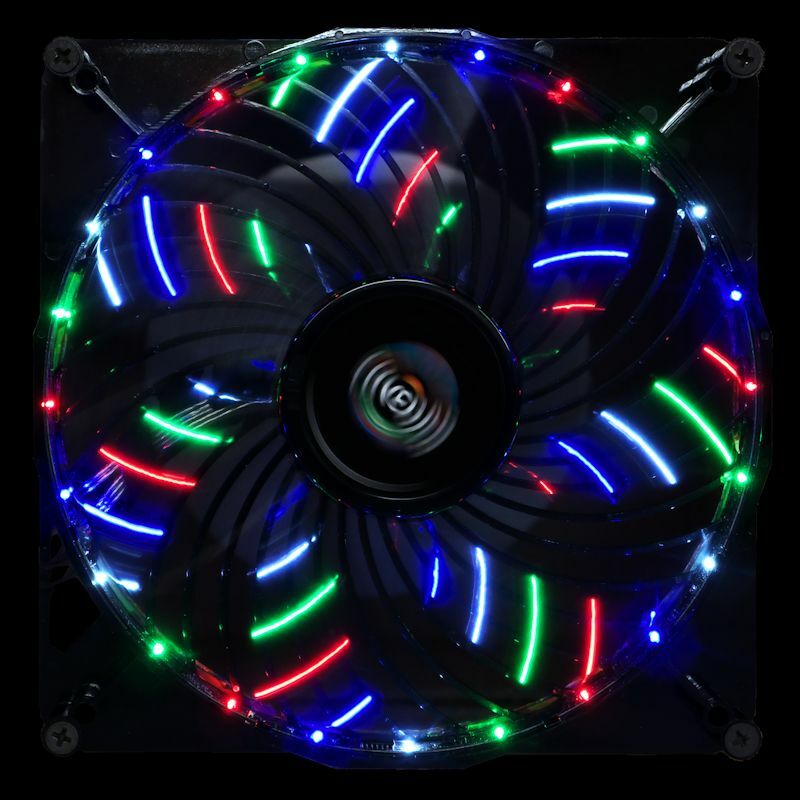 Tonight we shall be experiencing Enermax 180 mm fans with Blue LEDs, with Red LEDs, and with four LEDs of splashing, flashing color! And to up the ante, there is a switch on each fan to select any of three speeds! 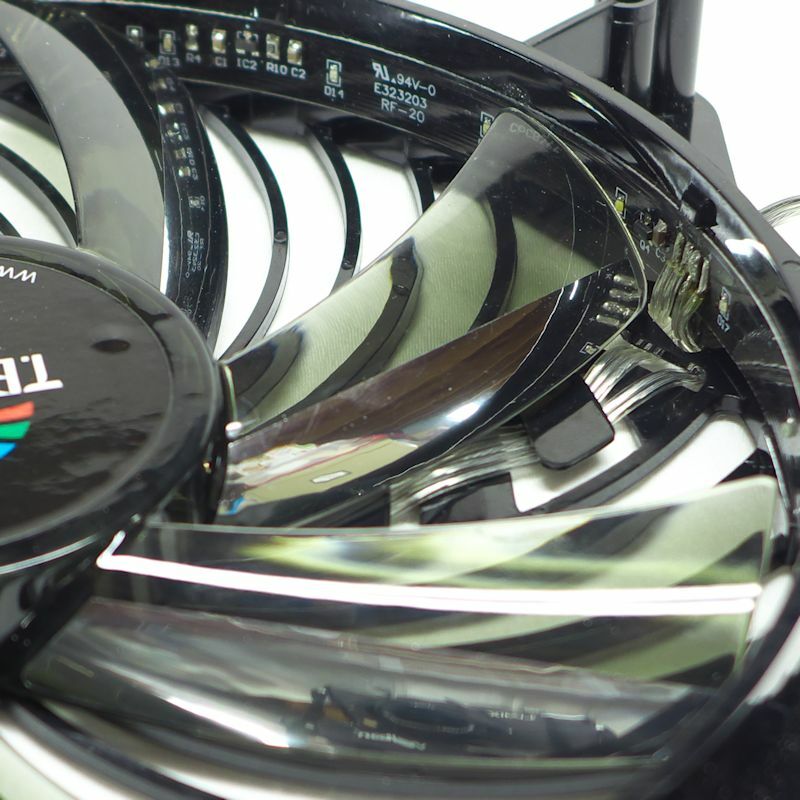 And to top it off, these fans are affixed to their frames with “Vortex” swirl airfoils that straighten the flow coming from the fan. Step right up and come inside! 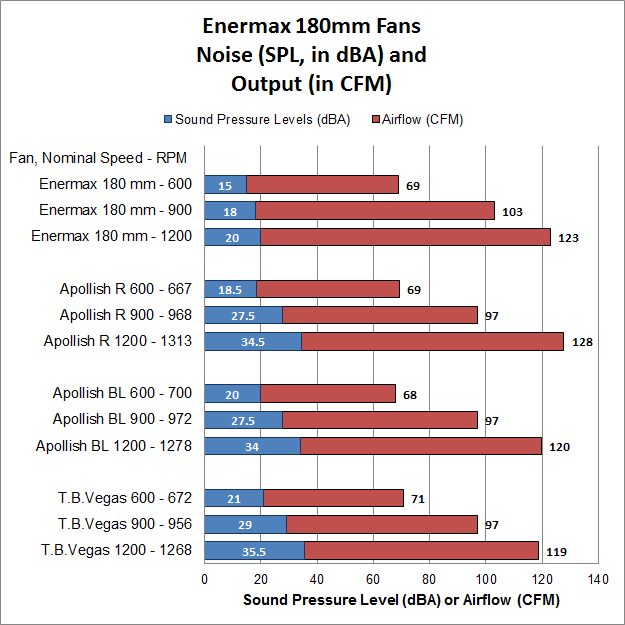 This review will focus on Enermax’s Advanced versions of their 180 mm T.B. 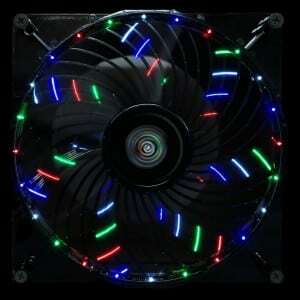 Apollish red and blue LED fans, as well as the Advanced T.B. 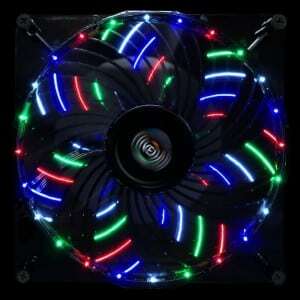 Vegas Quad four-LED fan with special effects. 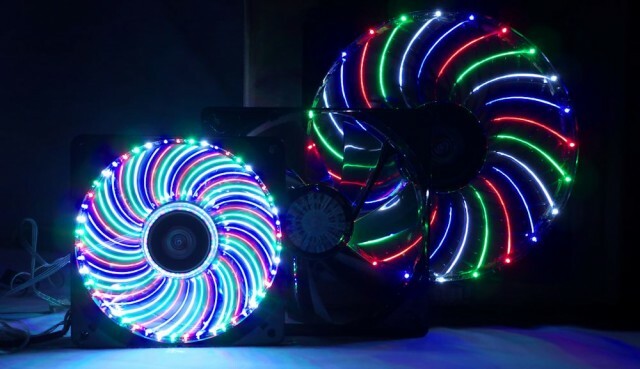 These fans were made with fun in mind, but they provide some serious cooling, and careful attention was paid to their design. They are well worth a look. 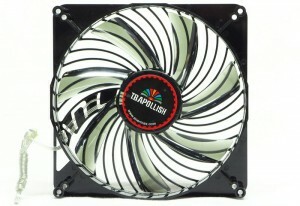 Enermax is a company well known to computer enthusiasts. 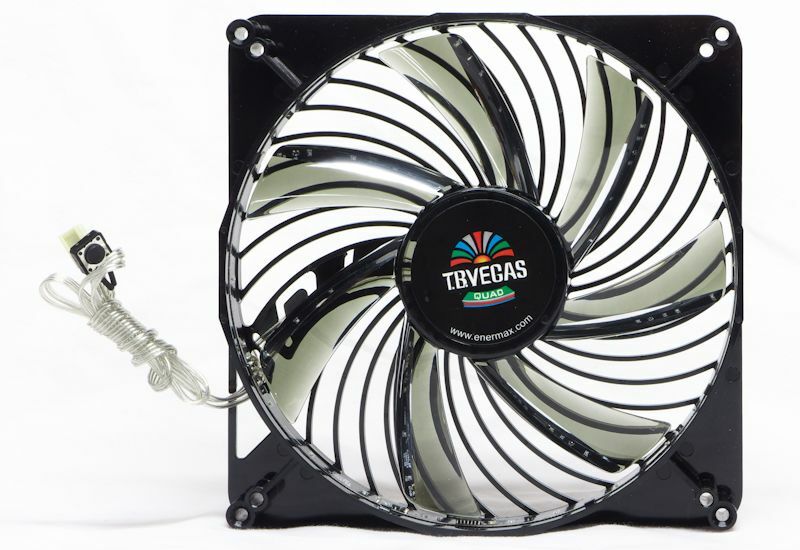 Founded in 1990, they sell a lot of products, from fans to heatsinks to cases to PSU’s. 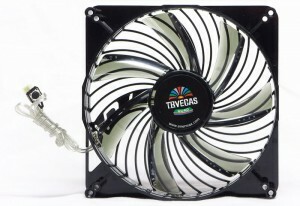 The Advanced series has been the company’s update to a number of its fans. 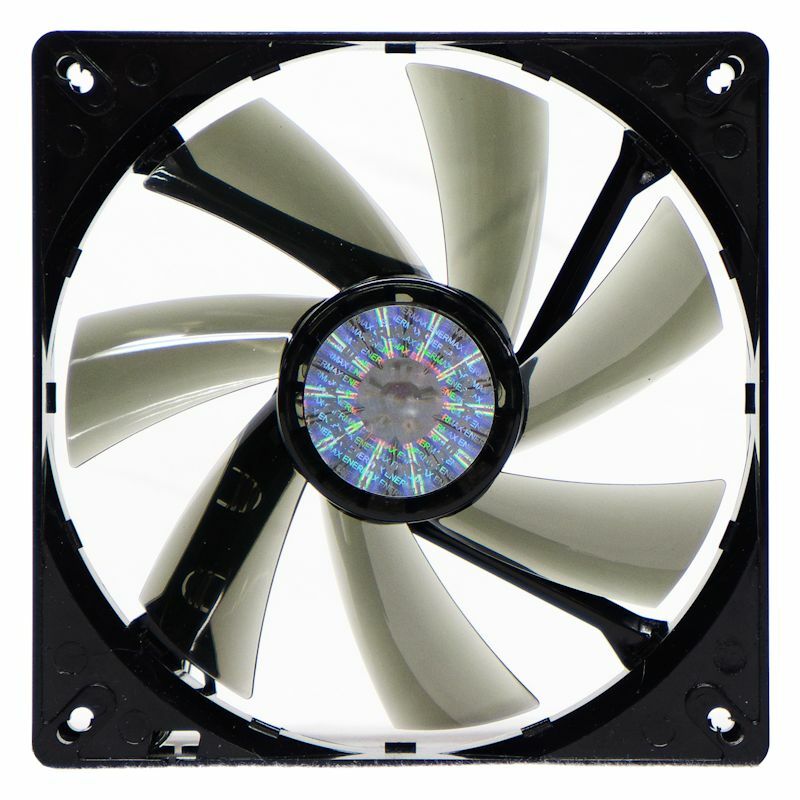 Each of the Advanced fans has a three-position switch on the hub that allows a user to select either the speed or the speed range (on PWM fans) to adjust the airflow/noise of a fan. In essence, you buy three fans. No more guessing as to how much of a fan you need. Note from Enermax: Please wipe the fan blades softly with a microfiber cloth instead of rinsing the fan blades with water. Do not use alcohol or chemicals. 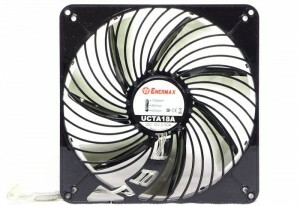 Enermax 18 cm fans come in windowed cardboard boxes with slick facing. 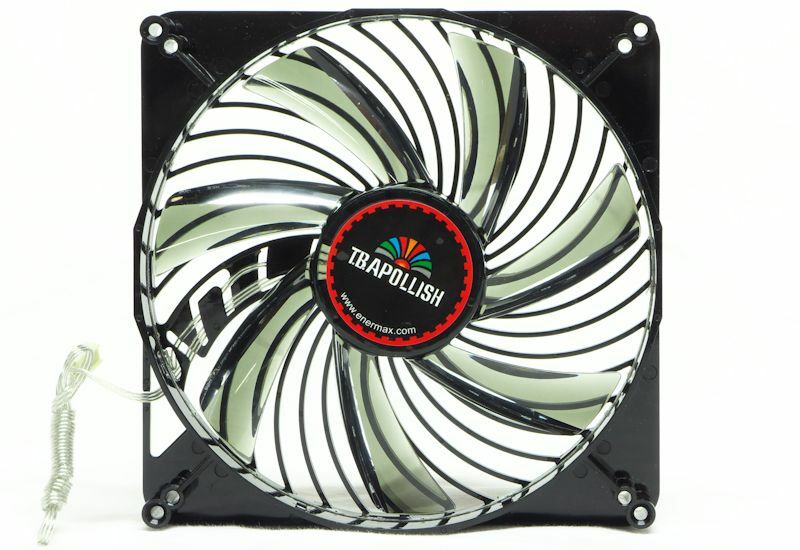 You can see the fan inside. The features and specs are on the outside. The accessories include four fan screws, which are to be expected. 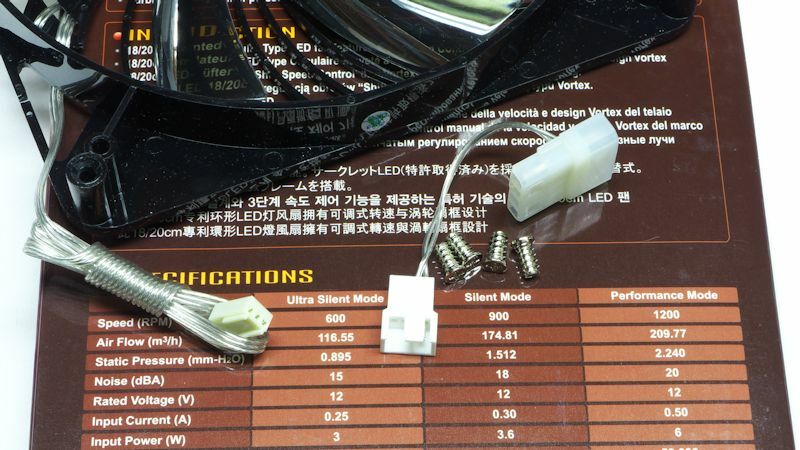 But dig, Enermax uses a Molex adapter that can accommodate PWM on the fan end. That’s a pretty good accessory. The T.B. Apollish and T.B. Vegas fans look pretty much the same when they are not lit. 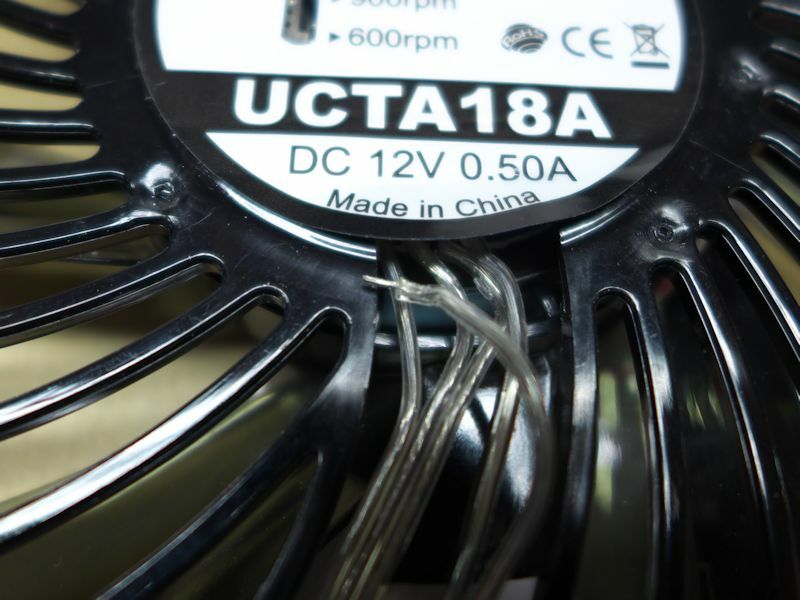 The switches are easier to reach than the switches on their 120 mm Advanced fans. In fact, you can stick your finger up to the fan and change speeds without seeing what you are doing – you can’t hurt yourself. In fact, that’s how I changed the speeds on these things while they were on the test box (more later). The slender fan blades bear a remarkable resemblance to their first generation, pre-Batwing 14 cm T.B. Silence blades. Since Enermax advertises these as “turbine blades,” it makes sense. 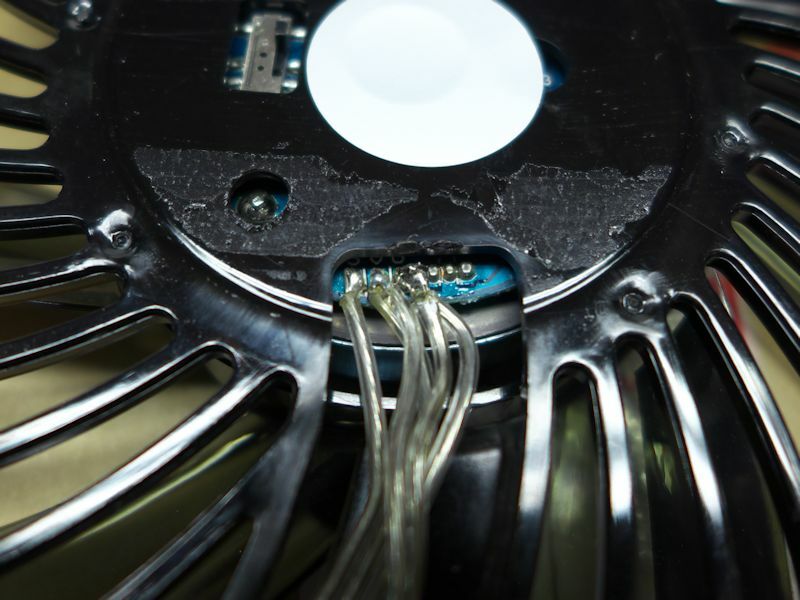 Each blade has a reflective part that takes up half the width of the blade and runs along the length to the end, reflecting the LED’s shining along the rim. In the picture below you can see the reflective part of the blades. The back rim has some LEDs on it. Putting it all together, we see the whole fan here. You can also see the paddle of the T.B. Vegas that allows you to change the light show. 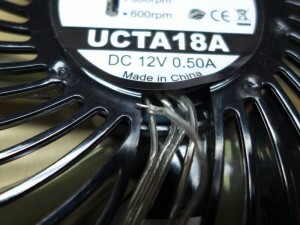 Finally, you get a nice view of the dual 20 cm and 18 cm screw holes at the corners of the fan. The fans were run in free air to register speed and noise. 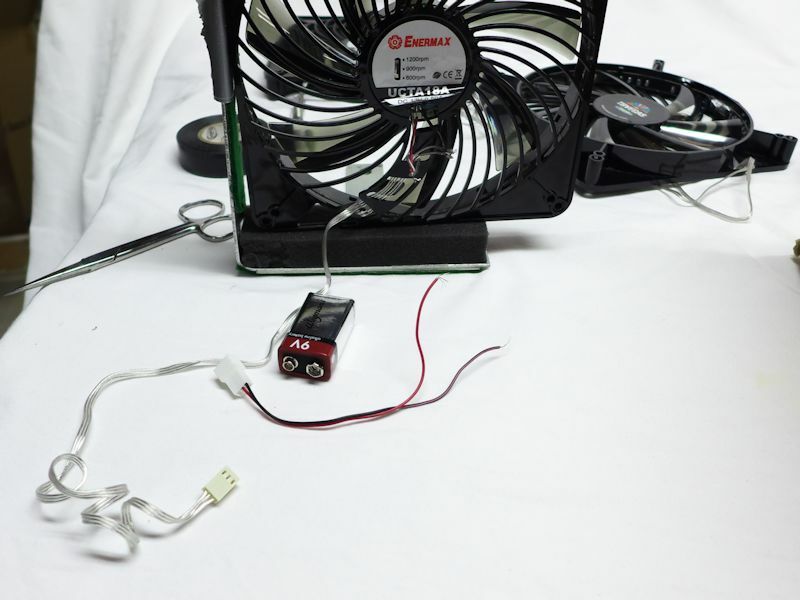 Sound Pressure Level was measured with a Tenma 72-942 Noise Meter mounted on a tripod, placed 10 cm from the fan. The SPL can, in theory, be adjusted downward 20 dB to get the noise corresponding to a distance of 1 meter. 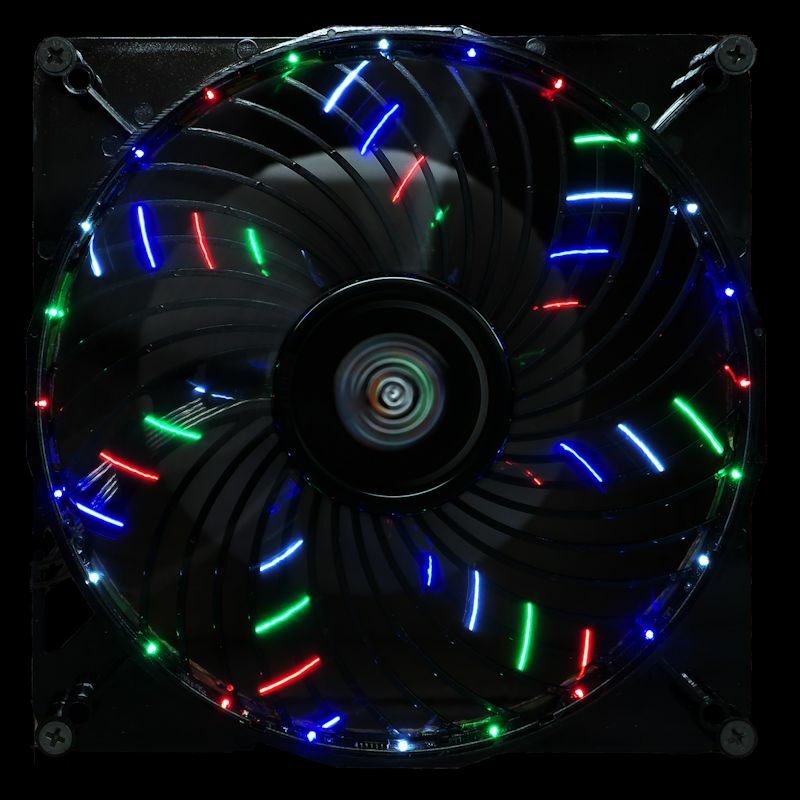 Since an 18 cm fan subtends a large disk at a mere 10 cm, expect the noise readings to overstate the SPLs produced by the fans. To preserve of the data across multiple reviews the method will remain constant. Unless an anechoic chamber can be obtained, this is the best we have. Measuring outflow from a fan presents problems. 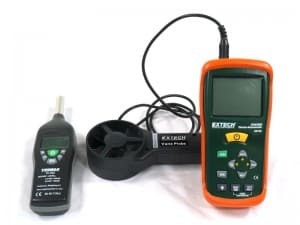 If you put an anemometer head up against a fan to measure its output, you only get a portion of the airflow because of the air shadow created by the hub. 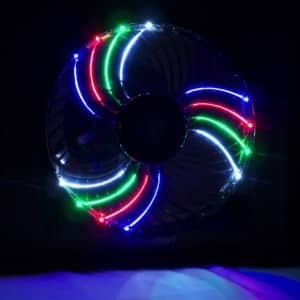 However, at a distance of 1.4 x the fan diameter allows for mixing to overcome the air shadow caused by the hub, but only if all the outflow is captured. 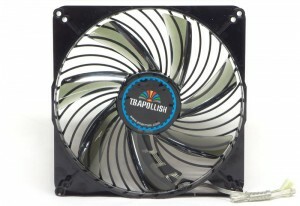 The output airflow of these fans were tested in an 8.5 x 10 inch box, 11 inches long, or 1.55 times the diameter of the fan. The input and exhaust openings were 172 mm diameter circles. What goes in must come out, and what each fan put into the box was measured as it came out by an AN100 Extech anemometer. 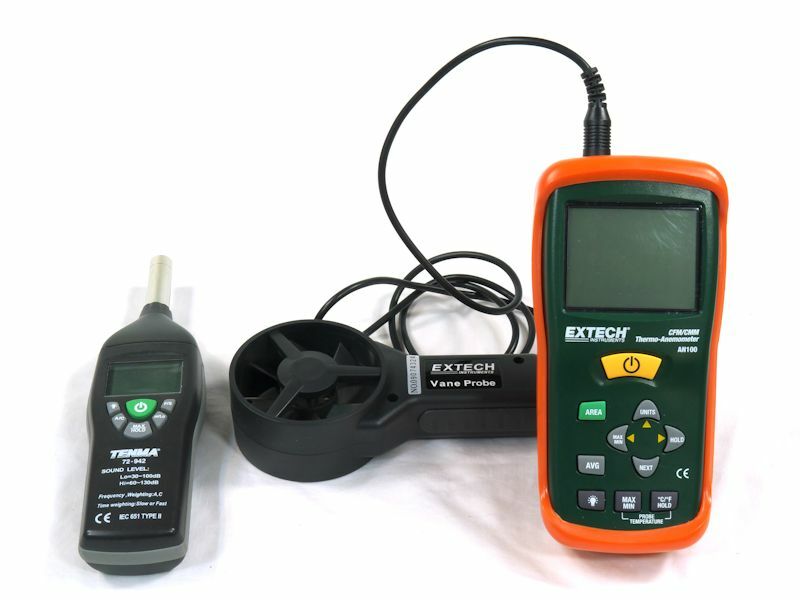 The anemometer head was introduced into the exhaust airflow and the flow was averaged across ten readings. 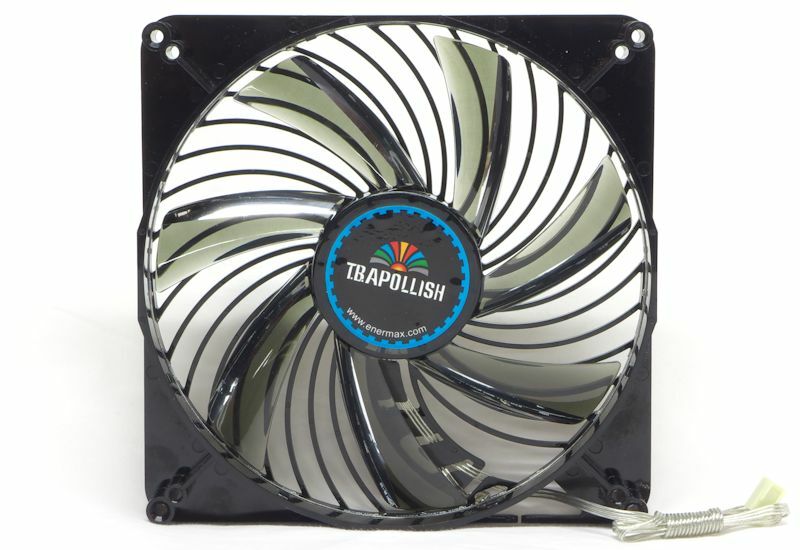 It may under-read the airflow because the air coming from the fan expanded into the box before exiting. A cylindrical air passage would help that, but we will have to make do with what we have. As you can see, the Enermax fans pretty much matched their specs. As expected, the fans measured as noisier than specified. 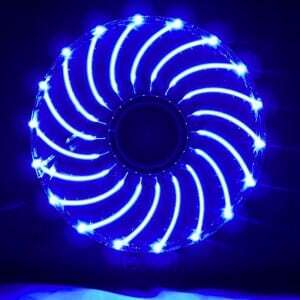 The Blue LED fan was gorgeous. The T.B. Vegas fan was dazzling. So, I set up the Red LED Apollish. It flashed a rich red, then went dark. Huh? Dark fan? I soon had the culprit… a wire had come loose (see the left picture). Was it reparable? Ha! An adventure awaits! You would RMA a dark fan, but I get the pleasure of fixing it. I love fixing things. When you want to repair something, it is best if you have an unbroken specimen to look at. 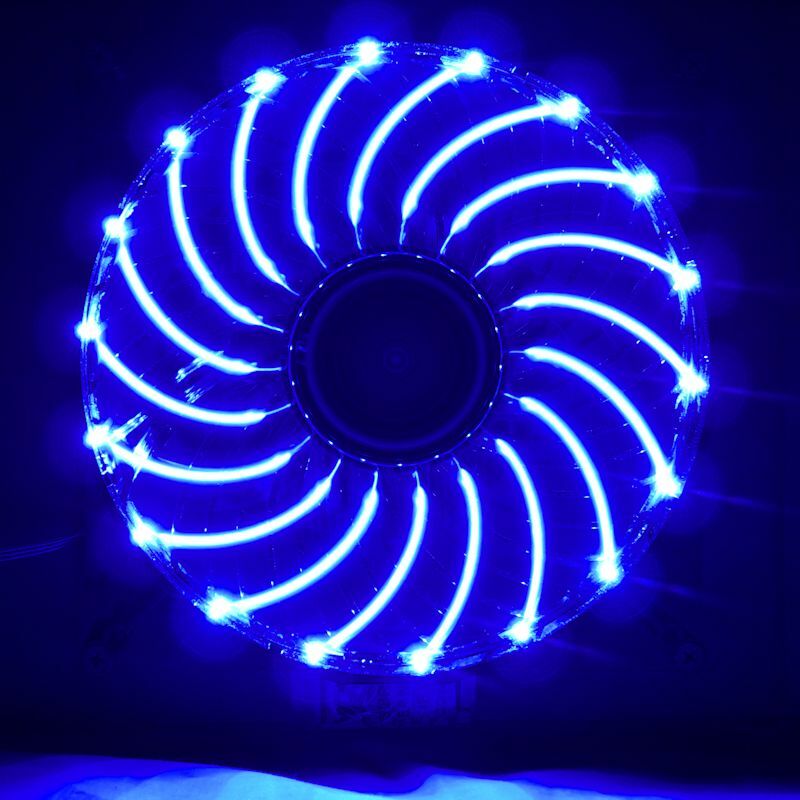 Hence, a shot of the Blue LED fan hub. Hmm. Two wires soldered on each of the 12 Volt and ground soldering nubs. That would be hard to do with a precision soldering iron, and mine is not precision. So, I soldered a single bridge wire to each nub, and soldered the two pairs of fan wires to the bridge wires. It was a crude repair, and I wasn’t sure of the polarity. Further, I didn’t want to risk burning out a PSU testing a fan. So, I used a 9-Volt battery to test it. Uh-oh. 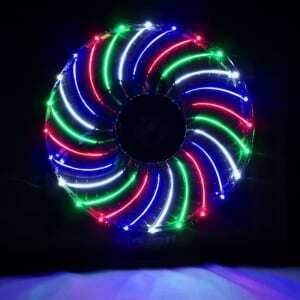 The fan spun, but remained dark. I de-soldered the fan wires, reversed the polarity of the LED wires, re-soldered, and tested again. 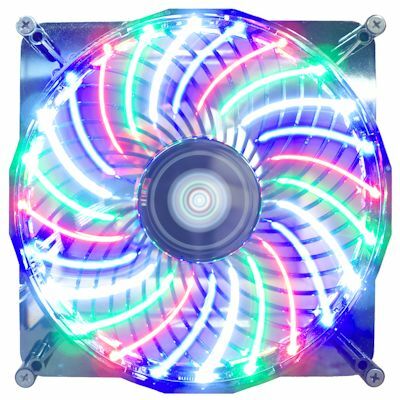 This time the fan ran and the LED’s lit up. All fixed! And did you notice? The reverse polarity did not kill the LEDs. It was a nice adventure, while it lasted. On to the light show! Here you have the 180 mm T.B. Apollish fans, with their red and blue LEDs. Now we explore the six modes of the T.B. Vegas. Here are a couple of shots from the Sparkle mode. Your eyes process light better than cameras with their virtual shutters. The pictures below will give you a bare idea of the flickering light patterns in this mode. Then there is the Triple Propeller mode, and what I call the casino mode. 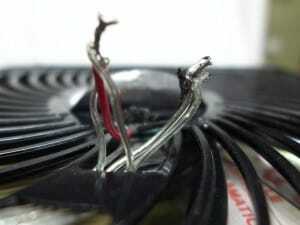 The fan did not run below about 5 volts. The LEDs were dark at that Voltage, and the fan clicked. 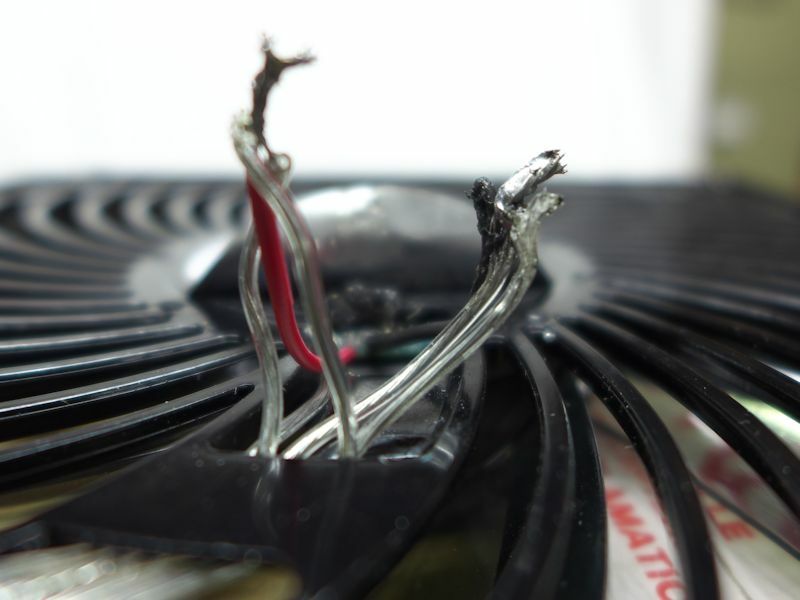 A dim glow appeared around 6 volts, and the fan rustled. At 7 volts and above, the fan’s LEDs shone ever brighter, and there was no clicking at all. 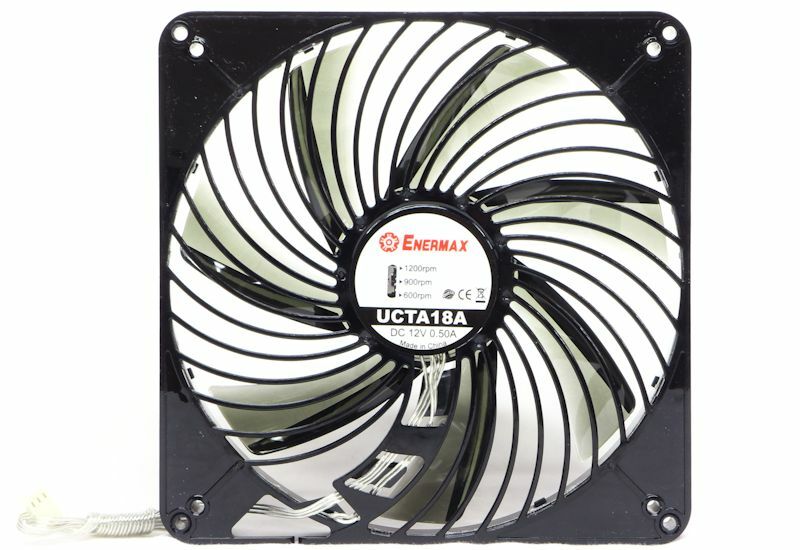 As we have seen before, the Enermax fans matched their specs. When companies do this, you can partly base your fan-buying decisions on specs – always a good thing. These fans are fun. 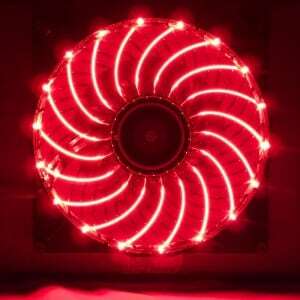 They also focus the airflow with their spiral airfoils. Those actually work, by the way. 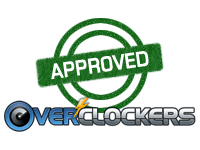 And you can switch speeds, which gives you a your choice of speeds rather than buying three fans to pick out the one that best suits your needs. Those are pretty seriously glorious fans. Thanks for the review, and for getting the equipment to do fan reviews right! That's rare and awesome. They are neither ugly nor stupid, and one nice thing about the T.B.Vegas is you can turn the lights off. And you're right about the airflow. Those 180mm babies really blow some air. I was surprised that the thin blades on the impeller do such a good job of getting air through the "vortex" vanes. But it happens. 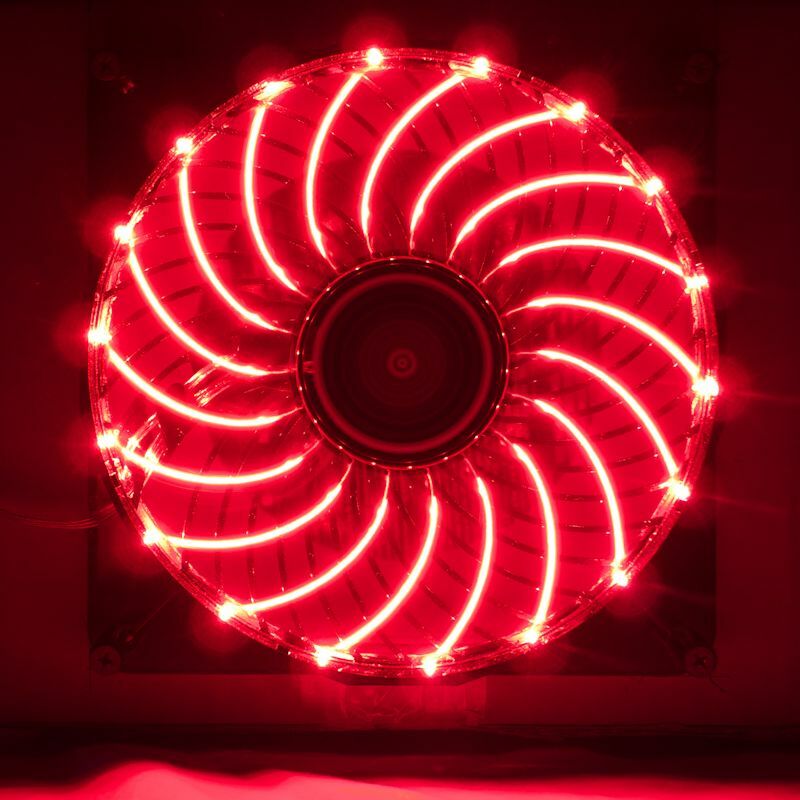 One thing: I compared my 8x8x8 box (for 140mm fans) before and after I put in a cylindrical air path. The airflow as measured went up 11-12%. 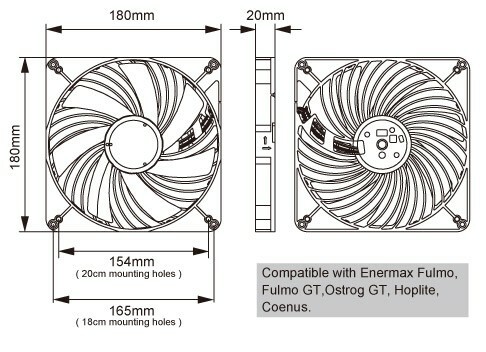 So if the same holds true for other large fans, the 180mm fans would be right on spec, rather than essentially on spec. i ment the look is only looks ugly for me ! If you see lines, it's the shutter speed.